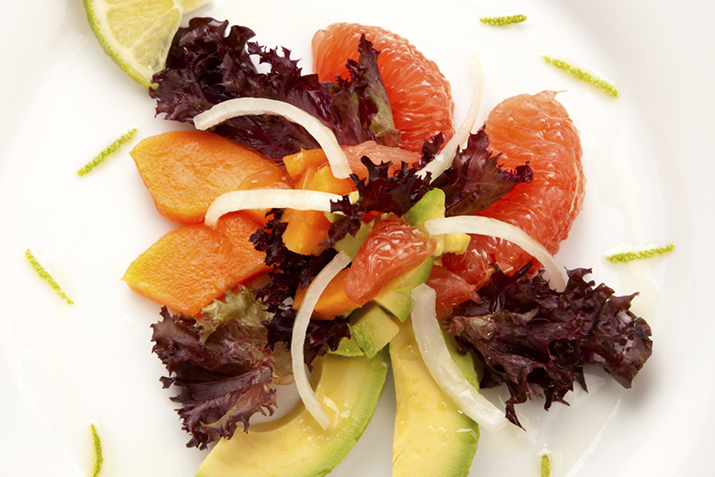 Tart grapefruit, creamy avocado and sweet honey mint dressing combine for a great tasting, healthy salad. Peel and segment the grapefruit, removing the white membranes. Squeeze the membrane into a bowl and reserve 2 tablespoons of juice for the dressing. Halve, pit, and peel the avocados, then slice lengthwise into half-inch slices. In a small bowl, prepare the dressing by whisking the minced shallot, fresh mint, honey, grapefruit juice, lime juice and zest, and a pinch of salt and pepper. Place a cup of lettuce on each of four salad plates. Top the lettuce with equal slices of grapefruit and avocado. Drizzle each salad with approximately 1 tablespoon of dressing. Perfect with a yogurt parfait for a light lunch, or accompanying roast chicken or a flaky steamed, grilled or baked fish like salmon.